Agreed. We have very similar climate preferences. 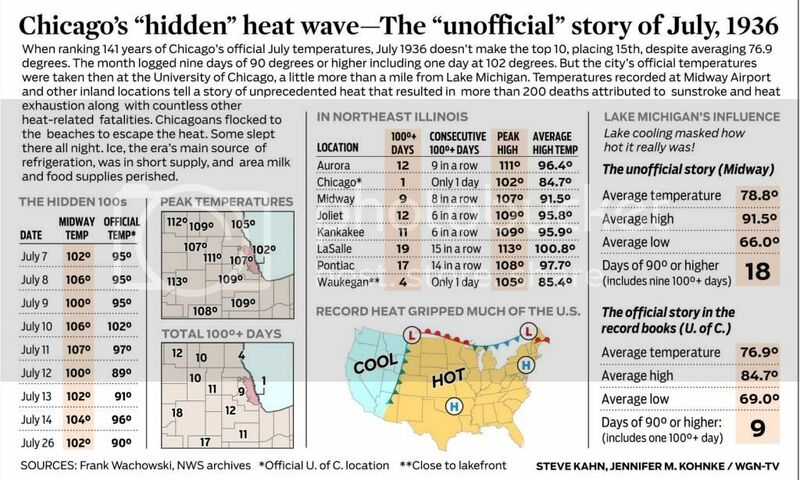 My biggest complaint with Chicago is that bouts of dry heat are unusual. While I like humid heat, I'd want a more even distribution between humid and dry heat. Do you prefer the drier heat or are you a sweat box lover? I personally prefer humidity, but with high temps of 27-29. When it's getting towards the mid 30's it's getting very uncomfortable IMO. I found NYC quite comfortable, although heatwaves may be different. Virginia was a different story though. Temps were 31/32C with dew points around 25C. That was very uncomfortable, especially working outside. Hmmph! I missed the edit cutoff point by mere seconds. Chicago, i like very hot and humid summer with thunderstorms and warm heavy short rain on some days. Very good sunshine hours and 4 seasons, i like Chicago climate. But the winter in Chicago are terribly cold ! I don't like the long drizzle of oceanic climate (London, Paris...). Although not all Oceanic climates have long periods of drizzle. I think drizzle is more a product of latitude or geography, than climate type. I don't think anywhere at 50" N/S will see short duration, heavy downpours as typical. Midwest can see very high dew point and heat index ! -35°C with 56°C heat index and 31°C dew Point in Newton in 2010 or a lot of days with heat index over 50°C in July 2011 in Knoxville Iowa ! Midwest are more humid than Miami ? I thought this was interesting. London's benchmark hottest month was July 2006. Here are the average highs at various major stations in the Greater London area.... Heathrow for some reason is the hotspot (anyone know why?). The other stations are within 1.2C of each other and none were more than 2C cooler then Heathrow. In other words pretty uniform across a 40-50 mile radius. For Chicago, there are several factors that contribute to temperature variations across the metro area. Proximity to the lake and UHI being the greatest. Perfect case in point was the benchmark heatwave of July 1936. Official records were then taken at the UofC. But look what they hid. Average max was officially only 29.3C at the UofC. Midway 9 miles inland it was 33.1C, Aurora 35 miles inland hit 35.8C, and within 50 miles of Chicago the average high reached 38.2C. Such extreme variations don't always happen though. It depends on how persistent lake winds are. July 2012, the average max at Midway was 33.4C, and actually it was one of the higher readings across the metro area. 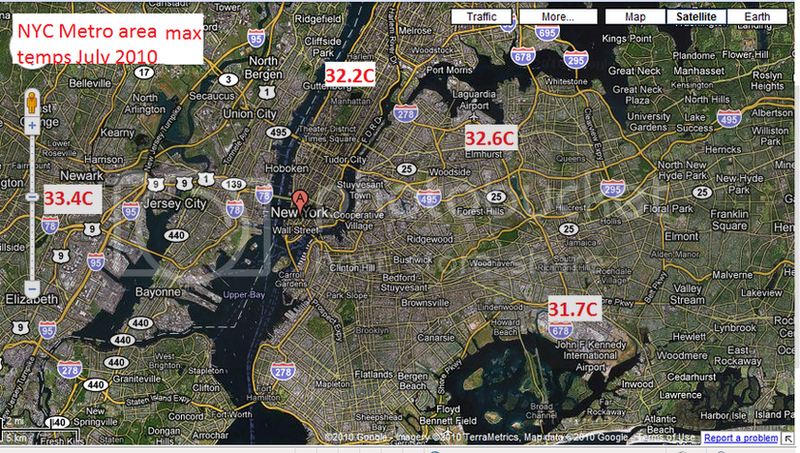 I studied the benchmark heatwave of NYC which was July 2010. I didn't see large variations in temps between various sites, though Newark which is more sheltered from the Atlantic was hottest (1.7C greater than JFK). Gatwick isn't in Greater London, but it's colder because it's elevated, to the south of the North Downs and not in the basin. City Airport is surrounded by water on 3 sides so is cooler than the rest of London. Newark is generally the hottest site of the region. I'm surprised there wasn't more variation. Sometimes JFK reports much lower temperatures — in this case it was one of the coldest in the northeast! I noticed that about Newark. Hey what happened to the NYC metro map that I posted!?!? Last edited by chicagogeorge; 09-12-2013 at 09:14 PM..
Last edited by Joe90; 09-12-2013 at 11:46 PM..